Fangirl Review: MARIO MASH UP COMING TO WII U EDITION MAY 17! MARIO MASH UP COMING TO WII U EDITION MAY 17! In a match made in block-shaped heaven, Nintendo is partnering with Mojang and Microsoft to bring the imaginative worlds of the Super Mario series andMinecraft together. For the first time ever, players will be able to fend off blocky Hammer Bros. and Dry Bones the same way they do Creepers and Zombies. On May 17, the Super Mario Mash-Up Pack comes to Minecraft: Wii U Edition as a free game update. After downloading the update, players who own the Minecraft: Wii U Editiondigital game, which launched last December, will have immediate access to new skins, a Super Mario-themed pre-made world and a set ofSuper Mario-themed music and item textures. All this new content is inspired by games in the iconicSuper Mario series, such as Super Mario World, Super Mario 64 andSuper Mario Sunshine. 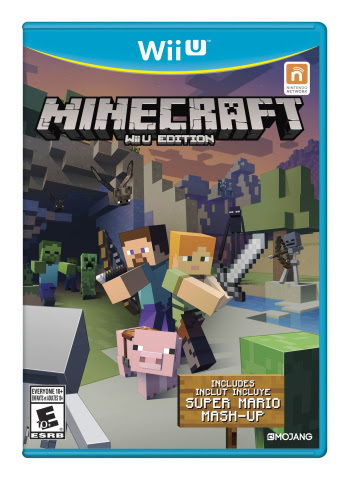 When the retail version of Minecraft: Wii U Edition launches in stores on June 17at a suggested retail price of $29.99, the Super Mario Mash-Up Pack will be included on the disc. Since launching in 2011, Minecraft has become a global phenomenon, selling more than 70 million games worldwide. The game places players in a massive randomly generated world, and lets them explore, harvest resources and craft anything their imaginations can conjure. The Wii U version ofMinecraft features Off-TV Play, touch-screen functionality and online multiplayer.